Thought-leader, author and futurist Rebecca Murtagh joins The Incite Group and 400 CMOs, executives and marketing minds from the world’s top brands, including; American Express, MasterCard, Citi, Shutter fly, KEDS, Hilton, Best Buy, Goldman Sachs, Samsung Electronics, GE Digital, Under Armour, KFC, Whole Foods Market, Moe’s Southwest Grill, Marriott Hotels, and many, many more at Brand Summit NYC on October 24-25th, 2017 in Brooklyn, NY. Brand Summit NYC, a top-tier marketing conference, offers marketers in any industry timely insights on topics vital to building a sustainable brand in 2018 and beyond. Presentation: Engaging Advertising: How to Create Content That Achieves Millions Of Organic Views Without Any Paid Media with Stoyo CEO Patrick Bales. Presentation: Create authentic, trustworthy and targeted content with Maurice Herrera, Senior Vice President, Head of Marketing of Weight Watchers. Registration is open for Brand Summit NYC. Enter Discount Code: Genius200 for a $200 discount. 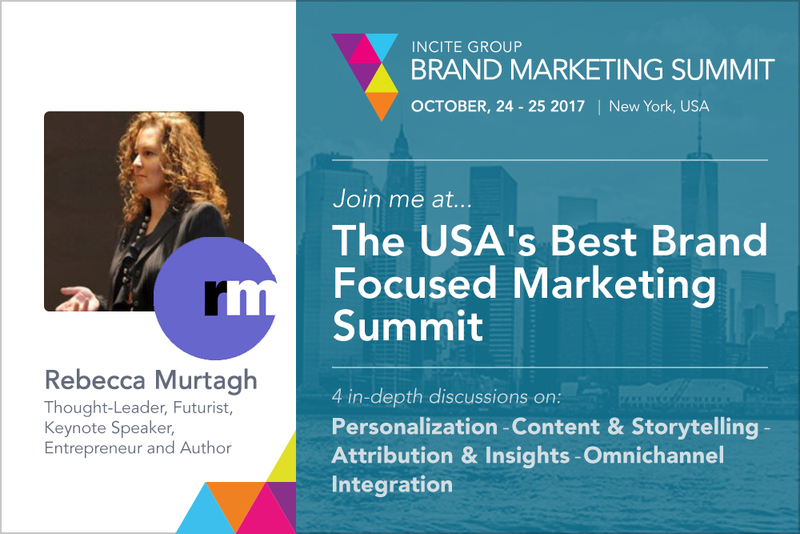 Psychology and Content Speaker at Marketing Conference Seen on Forbes and Inc.
International speaker and author, Rebecca Murtagh has been invited to return to Las Vegas in November 2017 to speak at Pubcon, one of the world’s most top marketing conferences. This Forbes “must-attend conference” and an Inc. “top conference for growing your business” invites industry’s top experts, like Rebecca, from around the world; to share their latest research, methods and insight on emerging trends in digital marketing, e-business, SEO, social media marketing, online advertising and business topics. Pubcon was recently rated the top marketing conference in the past two years according to an independent survey of marketing professionals over other popular marketing conferences. 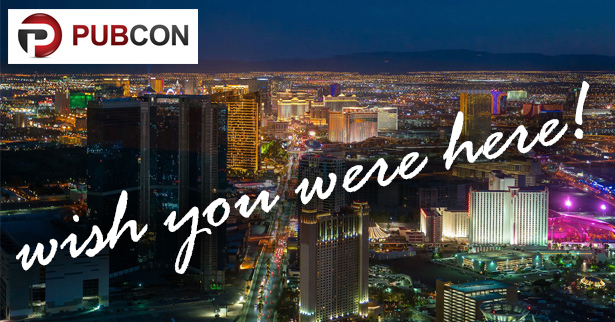 The 2017 annual conference and expo will be Rebecca’s 6th Las Vegas Pubcon appearance. Rebecca has presented at over a dozen Pubcon conferences since 2010, including Dallas, New Orleans, Waikiki, Austin, and Fort Lauderdale. “It is an honor to present at a conference featuring the brightest minds in the industry. Attendees come from around the world, expecting the very latest insights. Top-notch presentations, a value-packed agenda, and the dedication of the conference staff to deliver a quality ievent is why people return, year after year.” says Rebecca. Use Pubcon Discount Code rc-8639516 to save 15% on 2017 Las Vegas Conference Registration. Rebecca Murtagh, a veteran marketing conference speaker, will be speaking on the role of psychology in creating content on Pubcon Pro Industry Day , Thursday, November 9, 2017. With nearly two decades of experience creating personas and psychological profiles of audiences for a wide variety of websites, marketing and advertising campaigns across multiple industries; Rebecca will share research and data that reveals the role psychology can play in helping brands create content that will resonate with target audiences, compel visitors to click (and convert) on content that appears in search engine results, blogs, social media, YouTube, and more. Click for more session information. Rebecca Murtagh be also be moderating a panel on Influencer and Micro-Influencer Identification and serve as track chair on Agency and Enterprise Day at Pubcon which will cover timely topics related to influencer marketing, micro-influencers and community engagement on platforms such as Quora and Instagram. In a recent interview by Entrepreneur Magazine, Rebecca was asked to share tips for using the ‘About Us’ page of a website. Rebecca offered various tips based on her many years of experience working with start-ups as well as established brands, many of which are shared in her book ‘Million Dollar Websites: Build a Better Website Using Best Practices of the Web Elite’ which was also mentioned on Entrepreneur Magazine’s website. Rebecca emphasized that organizations of all sizes in all industries tend to overlook the opportunity presented by the ‘About Us’ page. As one of the most visited pages on a website, this page must offer more than a two paragraph history. It can include images, photos, videos, links to blogs, social media profiles, calendars, or any number of opportunities to further engage visitors. Because the interview included thoughts from other thought-leaders, many of Rebecca’s tips were not included. “Daniel asked great questions, and I know from example that most organizations view the ‘About Us’ page of the website as a boring necessity, yet it can be so much more – so I definitely see a blog post expanding on the topic in my future”, says Murtagh. View the full article on Entrepreneur.com. Rebecca Murtagh is a recognized futurist and thought-leader in brand, marketing, E-Business, social media, SEO and mobile. Author of Million Dollar Websites: Build a Better Website Using Best Practices of the Web Elite in E-Business, Design, SEO, Usability, Social, Mobile and Conversion, Rebecca shares insights learned from her 20+ years of experience working with Fortune 500, Silicon Valley start-ups, small businesses and just about everything in-between.